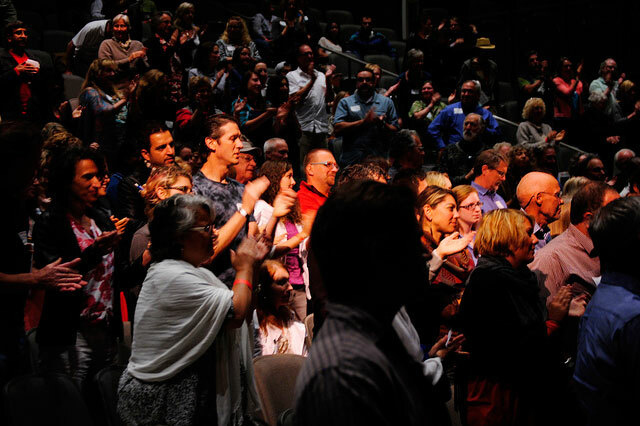 The x in TEDx refers to independently organized TED events, an initiative that started in 2008 to bring TED-like gatherings to smaller communities — like Santa Cruz. These events — 1,500 of them scheduled all over the world so far in 2015 — spark conversation and connection in the spirit of ideas worth spreading. At a TEDx event, TEDTalks video and live speakers combine to spark deep discussion and connection in a small group. These self-organized events are branded TEDx and are subject to certain rules and regulations. The mission of TEDxSantaCruz is to bring together a community of some of the brightest and most innovative thinkers who contribute to solutions for our local and global challenges. Our purpose is to establish fresh, new conversations, perspectives, and exposure to different ideas from Santa Cruz and the world beyond. We provide a stage and platform for the very best ideas, thoughts, and actions generated in Santa Cruz County. TEDxSantaCruz hosted its first conference on June 11, 2011, at the Cabrillo College Music Recital Hall. With 27 speakers and performers, a sold-out crowd of 350 audience members, more than 15,000 individuals and groups from 10+ countries who tuned to the live stream, and more than 1 million views of our videos, TEDxSantaCruz: Engage accomplished our goal to help share ideas and inspire engagement here and around the world. On September 15, 2012, we held our second, full-day live event at Cabrillo College’s 500-seat Crocker Theater. With 17 speakers and an audience of thought leaders, we presented TEDxSantaCruz: Open, featuring 17 speakers and performers whose experiences, projects, work, or creativity speak of openness, beginnings, transparency, radical availability, and open-source initiatives. TEDxSantaCruz: Radical Collaboration occurred on April 24, 2015, at the Rio Theatre, 1205 Soquel Avenue, Santa Cruz. 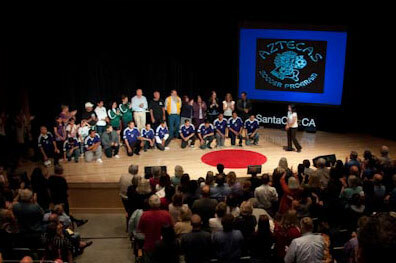 On March 8, 2014, TEDxSantaCruz held its latest full-day live conference, also a sell-out event. TEDxSantaCruz: Activate featured 25+ speakers sharing ideas that sparked experiences, projects, work, or creativity that is setting in motion a new reality, igniting new connections, or energizing communities. The TEDxSantaCruz community gathered for a full day of exhilarating live talks, TED videos, and deliciouslunch served poolside at the fabulous Hotel Paradox. Speakers, organizers, and attendees downloaded at a celebratory after-party reception to share our inspirations, comments, and feedback. TED is a nonprofit organization devoted to Ideas Worth Spreading. It started in 1984 with Richard Saul Wurman’s observation of a powerful convergence among three fields: technology, entertainment and design. The first TED event included a demonstration of the compact disc, the e-book, and cutting-edge 3D graphics from Lucasfilm, while a mathematician demonstrated how to map coastlines using fractal geometry. The annual conference started in 1990 when Wurman and TED co-founder Harry Marks attracted an influential audience in Monterey, united by their curiosity and open-mindedness. Twenty-five years later, TED has grown to support world-changing ideas with multiple initiatives. The two annual TED Conferences invite the world’s leading thinkers and doers to speak for 18 minutes on a diverse mix of topics. These talks are recorded for free access at TED.com. TED speakers have included Bill Clinton, Bill Gates, Jane Goodall, Elizabeth Gilbert, Sir Richard Branson, Nandan Nilekani, Philippe Starck, Ngozi Okonjo-Iweala, Isabel Allende, and Roger Ebert. TED’s media initiatives include TED.com, where new TED Talks are posted daily; the TED Radio Hour, a co-production of TED and NPR; the Open Translation Project, which provides subtitles and interactive transcripts as well as translations from volunteers worldwide; the educational initiative TED-Ed; and TEDBooks, short e-books on powerful ideas. TED has established the annual TED Prize, where exceptional individuals with a wish to change the world get help translating their wishes into action; the TED Fellows program, helping world-changing innovators from around the globe to amplify the impact of their remarkable projects and activities; and TEDx, which supports individuals or groups in hosting local, self-organized TED-style events around the world. Follow TED on Twitter or on Facebook. For information about TED’s upcoming conferences, visit TED.com.